For PowerShell newbies one of the strangest comparison operators is -eq. 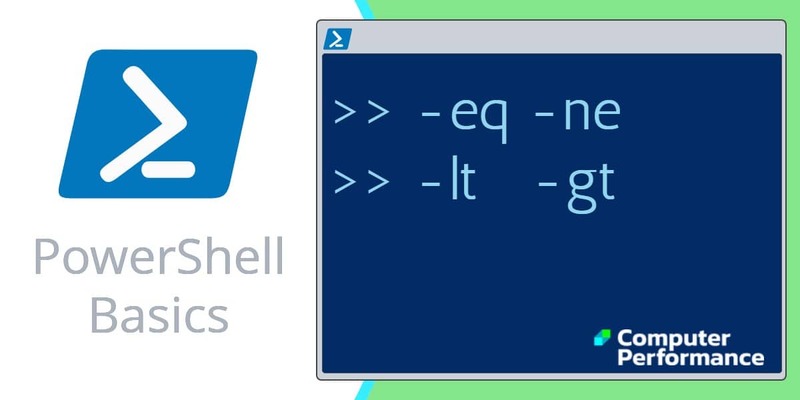 While you still need the equals sign ‘=’ for declaring variables, in most other cases you need PowerShell’s -eq. At first using -ne for ‘not equal’ also seems odd, but once you warm to this theme of dash followed by initial letters, then -gt (greater than) or -lt (less than) will seem a logical continuation. Consequently, abandon > <, instead employ -gt or -lt instead. Note 1: About the only tricky aspect of the -eq syntax is whether to put the comparison object in single or double quotes. The difference is that “Double Quotes” expands any variables; whereas ‘single quotes’ are treated as literals. In this example either “.dll” or ‘.dll’ would achieve the desired listing. See more about quotes here. Note 2: We employ an ‘If’ statement to act upon the output of the Test-Connection cmdlet. Note 3: Remember that instead of an equal sign (=), PowerShell uses -eq. One benefit is that it’s easy to use the negative -ne (PowerShell’s not equal). In PowerShell, greater than is abbreviated to -gt. Observe how both -gt and -lt (less than) are preceded by a dash. Note 5: The point of the above comparison example is to find large files; to be precise to list files greater than 2MB. Note 6: As 2MB is a pure number it needs no quotes. Note 7: Be aware that if you want to get this example to work you either need a D: drive, or else change the value of $FileSource. Normally all these comparison operators are not case sensitive. However, to select on the precise UPPER or Proper case precede the operator name with a “c”. PowerShell uses the equals sign ‘=’ for declaring variables, but for genuine comparison operations you need -eq. Also, for not equal, use the -ne operator. When comparing greater than or less than, it is logical to use -gt and -lt, avoid > or < in these instances.